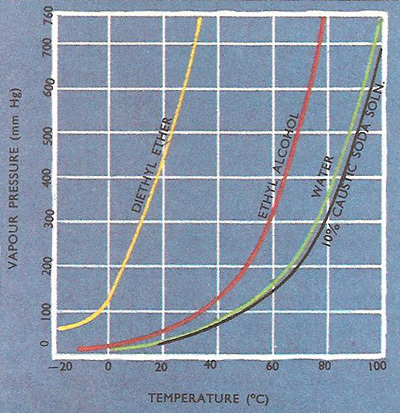 Graph showing the variation of vapor pressure with temperature for several liquids. A liquid boils when its vapor pressure equals the pressure of the atmosphere. When air is saturated with vapor the same number of molecules leave the liquid surface as return. Raising the temperature increases the number of molecules remaining in the air. A simple method of measuring vapor pressure. Vapor pressure is the pressure exerted by a vapor in equilibrium with its liquid or solid. In an enclosed space this occurs when equal numbers of molecules are entering and leaving the vapor, which is then saturated. For a pure substance, the saturated vapor pressure (SVP) depends on the temperature. The boiling point of a liquid is reached when the SVP equals the external pressure. After a short sharp shower on a hot summer's day the thin film of water left lying on the road disappears quite rapidly. However, if the weather were not so warm, a much longer period would pass before the road surface dried out. This is but one example of the process known as evaporation in which the liquid (water) has turned into vapor. All liquids evaporate to a greater or lesser extent. The rate of evaporation depends upon the temperature. At ordinary room temperature ether evaporates more rapidly than water, while only a very small quantity of mercury is turned into vapor. There are even a few solids which evaporate fairly easily. For instance, if some iodine crystals are heated to 113°C and kept at that temperature for some time the iodine vaporizes without there being any sign of the crystals melting (i.e. turning to liquid). All the water lying on the road eventually disappears because once some of the water has turned to vapor, this vapor is dispersed through the air by the motion of the other gas molecules. There is a continual change of air over the puddles. However, if the evaporation occurs in a closed space (e.g. in a jar with a close fitting lid) and at a steady temperature, the fall in the volume of liquid ceases after time. The air is then said to be saturated with vapor. In accordance with Dalton's law of partial pressure the vapor of the evaporating liquid exerts a pressure just as if it were the vapor alone which occupied the space in the jar. This suggests a convenient means of measuring the pressure of the vapor. Two simple mercury barometers are set up beside on another (see diagram below). Then a small quantity of the liquid is introduced into the foot of one of the barometer tubes. This liquid rises up inside the tube and evaporates as soon as it reaches the mercury surface. The vapor entering the vacuum space causes the level of the mercury to drop and the differences between the levels in the two barometer tubes is the pressure exerted by the vapor. The maximum pressure difference at the particular temperature will be obtained when some of the liquid remains floating on the mercury surface. The movement of the molecules within a liquid is considerably restricted (compared with molecular movement in a vapor) because of the action of intermolecular forces. At the liquid's surface the forces of attraction are sufficient to prevent the majority of molecules from getting away, but a few molecules that have acquired rather higher velocities do overcome the forces of attraction and escape to become vapor. Once a number of these molecules have turned to vapor, some of them will strike the liquid surface again and become liquid once more. The number of vapor molecules alighting on the liquid surface depends upon their concentration in the vapor (i.e. upon the partial pressure of the vapor). After a while a state of equilibrium is reached when the number of molecules leaving the liquid equals the number which reenter it. Under these conditions the air is saturated with vapor. At low temperatures the energy of the liquid molecules is small so that not many of them have enough energy to escape, but as the temperature is raised the average velocity of the molecules rises so that more do escape. Thus the vapor pressure of a liquid rises as its temperature is increased. When the vapor pressure is equal to the pressure of the atmosphere, bubbles of vapor are formed within the body of the liquid and boiling commences. Liquids boil at lower temperatures if the pressure above them is reduced, as on a mountain side, whereas their boiling point can be raised by increasing the pressure as in a pressure cooker.